Beautiful weather here today! I checked the tires and oil and managed to fire up the Yamaha Seca II, my 17-year-old 600cc sport-touring motorcycle, and took it for a nice ride. 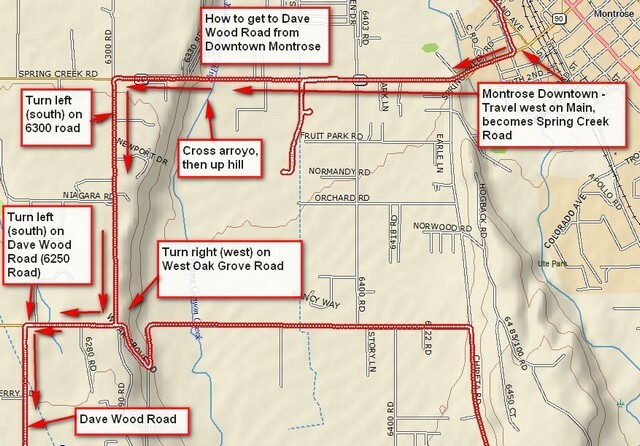 In my travels today I happened to capture the track for the best way to get to Dave Wood Road from Montrose. It’s a bit hard to find, so I’ve provided the annotated GPS track, plus written instructions below. Dave Wood Road was the original wagon road between Montrose and Telluride, so it’s the oldest road around here. From Downtown Montrose, Colorado, travel west on Main Street. It quickly exits downtown and after a bit becomes Spring Creek Road and heads due west. You’ll go a couple miles, then find yourself climbing a rather steep (paved) hill. Turn left at the top onto 6300 Road. Note that you’ll be following Colorado Highway 90. Follow 6300 south to its end, then turn left onto West Oak Grove. Follow this for only a half mile, then turn south on Dave Wood Road. There is a sign. Dave Wood Road is also 6250 Road. This entry was posted in GPS Tracks, Montrose County, Motorcycling and tagged dave wood road, gps track of Dave Wood Road, montrose county, motorcycling. Bookmark the permalink. If you have the time I would like to hear your take on what you think is a good multi-band wire antenna. I use a OCF dipole it’s OK but I feel I can do better.